Talk all you want about LUV U here. Karen Reyes wrecked a relationship on “LUV U” last Sunday because she kissed Marco Gumabao who plays as Miles Ocampo’s boyfriend on the teen comedy series. Because of her fine portrayal in the episode, the pretty actress was asked if she has experienced the same dilemma. “It’s not my personality to wreck relationships. I believe there are a lot of guys out there and I don’t need to steal someone’s boyfriend,” said Karen. On “LUV U” this Sunday, Camille (Miles) and JB’s (Marco Gumabao) relationship will be on the rocks because of the kiss mark Camille saw on her boyfriend’s cheek after he and Ayen (Karen) were locked in a stock room. Whitney (Kiray Celis) on the other hand, is having the time of her life after Rocky’s (Igi Boy Flores) romantic gesture. Will Whitney and Rocky take their friendship to the next level and will Miles and JB still be able to save their relationship? 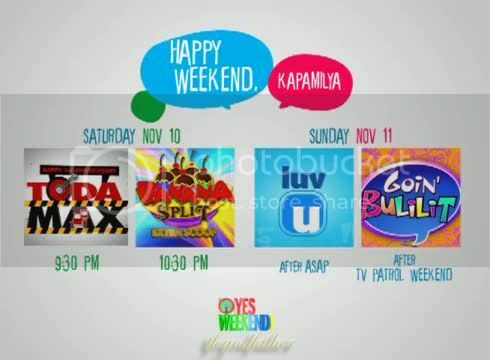 Find out on “LUV U” this Sunday (November 18) after “ASAP 2012” on ABS-CBN. Manny Pacquiao's variety show on its final round? According to the circulating news online, Filipino boxing icon Manny Pacquiao's show on GMA Network titled "Manny Many Prizes" will bid goodbye on December 16. "Manny Many Prizes" which was supposed to be a GMA Network's answer to TV5's "Wil Time Bigtime," is going to end before the year ends. This variety-game show started last year on July 16, 2011 as a Saturday night variety-game show and transferred to Sunday afternoon timeslot (after "Party Pilipinas") on August 5, 2012. "Manny Many Prizes" was led by Saranggani Rep. and Filipino boxing icon Manny Pacquiao along with other Kapuso stars such as Paolo Contis, Gladys Guevarra, Onyok Velasco, and Pekto and special co-hosts every Sunday. Good thing GMA Network finally axed Manny Pacquiao's variety-game show. It never stood a chance in the ratings against "Luv U" on its new timeslot. Manny really deserves a much better show than this.